Bobby Orr of the Boston Bruins, circa 1975. Last week, the basketball website Ballislife.com tweeted a fun exercise, asking NBA fans to pick their dream starting five. The catch? It assigned dollar values to each legend and set up a monetary constraint which no lineup’s total cost could exceed. Do you want Michael Jordan as your starting shooting guard? OK, but he’ll cost you $5 of the $15 you have, so now you have just $10 of cap money to spend on four other players. Neil Greenberg, who runs The Washington Post’s Fancy Stats blog, posted his dream team analysis Thursday, and I thought it would be fun to take another look at the pros and cons of dream team building from an advanced stats point of view. Even at $4, Dominik Hasek is a steal. (As Greenberg noted, Hasek’s save percentage was much better than that of contemporaries like Martin Brodeur, even though Hasek is worth only $1 more than Brodeur by Henderson’s values.) In fact, during his career, Hasek was the outlier of all goaltending outliers. Because of the large influence of random variation in save percentages, most goalies can’t consistently distinguish themselves very much from an average netminder. But Hasek seemed to be the exception. In his career, he allowed 79 percent as many goals per shot as the league did, and was one of the only goalies ever to consistently sustain a very high level of play over a number of consecutive seasons. Hasek’s basically a no-brainer as the goalie for this team. As an aside, if Hasek had not been available, it might have made sense to buy the $1 goalie (in this case, Ed Belfour, a fine goalie who allowed 93 percent as many goals per shot as the league over his long career) and spend more on building a strong lineup of skaters. Because it’s difficult to predict how well a goaltender will play in a given season (much less a series or a game), it doesn’t usually make much sense to sink a huge percentage of a team’s payroll into one of them — a good piece of strategy in this exercise and in life. The four most valuable non-goalie seasons ever according to Tom Awad’s all-in-one stat Goals Versus Threshold (GVT; think Value Over Replacement Player for hockey) belong to Bobby Orr. Orr costs the maximum “salary” here ($5), but the difference between his production at his peak (an average of 45.6 goals above replacement per year in his best five seasons, with a career-high of 49.5 in 1970-71) and that of the next-best defenseman is truly massive. Among the next-best available D-men, neither Paul Coffey, Larry Robinson nor Denis Potvin ever produced a GVT better than 31.1 in any of their seasons. Speaking of Larry Robinson, it’s worth noting that he costs only $2 in salary despite putting up some of the best seasons by a defenseman in NHL history. In 1976-77, Robinson notched 85 points (ranking 12th among all players, not just defensemen) and set the non-Orr record for highest plus/minus in a season with a +120 mark. That performance was worth 30.4 goals above replacement in GVT’s estimation; Robinson also had five other seasons of at least 19.9 GVT, giving him a higher five-year peak than Nicklas Lidstrom despite Lidstrom costing more than twice as much in Henderson’s dollar values. On the wings, we’re now essentially “stuck” with $1 pickups Jari Kurri and Johnny Bucyk as Gretzky’s linemates. There are a couple of reasons why this isn’t a bad thing, though. First (and this should be self-evident): Kurri and Bucyk are both Hall of Famers! It’s not like we’re picking from the dregs of the hockey universe here. In fact, Kurri and Bucyk had better GVT numbers in their best five seasons than Brett Hull and Luc Robitaille did in theirs, despite Hull costing four times as much as Kurri and Robitaille costing five times as much as Bucyk. Secondly, statheads have found evidence that — despite the importance placed on strong depth in hockey’s conventional wisdom — building a top-heavy team with a few stars and a bunch of lesser players is not such a bad thing. 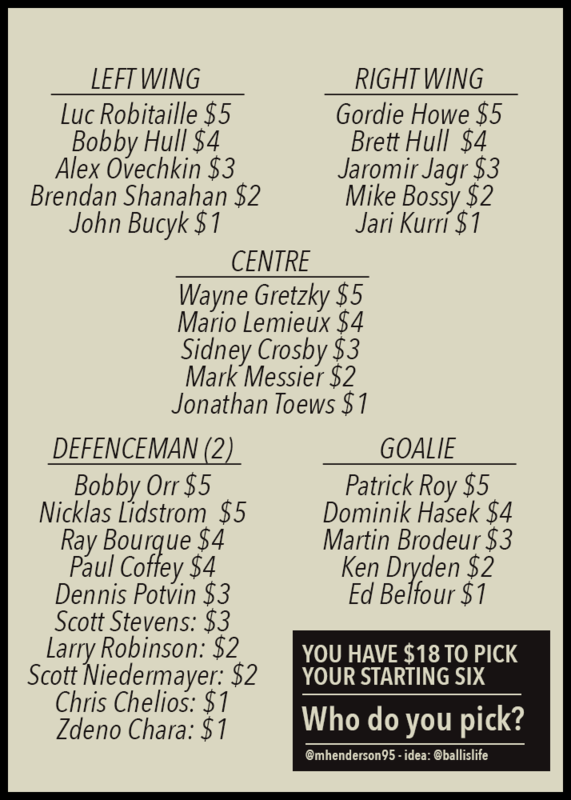 So, there you have it, the best team our $18 could buy: Hasek, Orr, Robinson, Gretzky, Kurri and Bucyk. According to the average of each player’s best five seasons, our team would produce 200.3 GVT in a hypothetical full season. In a perfect universe, our team would face that of Greenberg (Hasek, Mark Messier, Bobby Hull, Mike Bossy, Lidstrom and Zdeno Chara) and everyone else in the Twittersphere, and settle the matter on the ice. Obviously, that can never happen — and maybe it’s more fun this way anyhow.